At Kismet, the junction of highways 16 and 37, I have a moment of doubt and nearly turn back. There’s no strong game plan here, just an urge to press northwards. 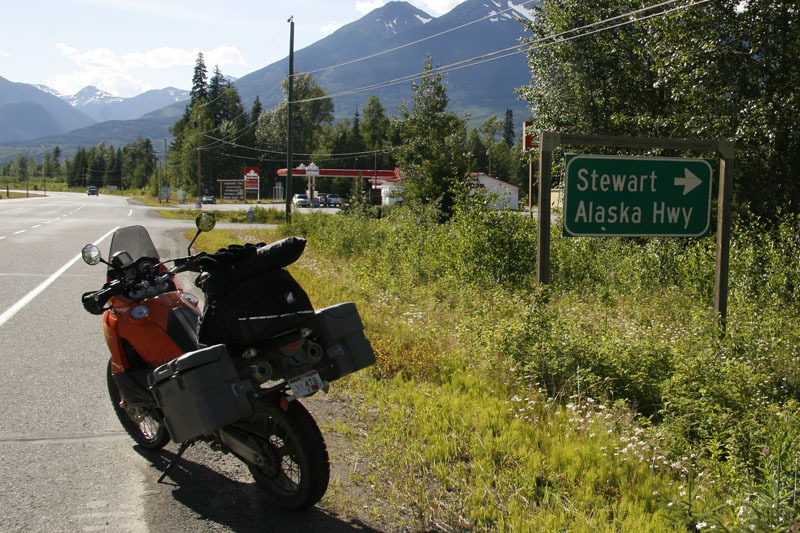 The sign here in Kismet reads “North to Alaska” conveying the enormity of North’s possible meaning. 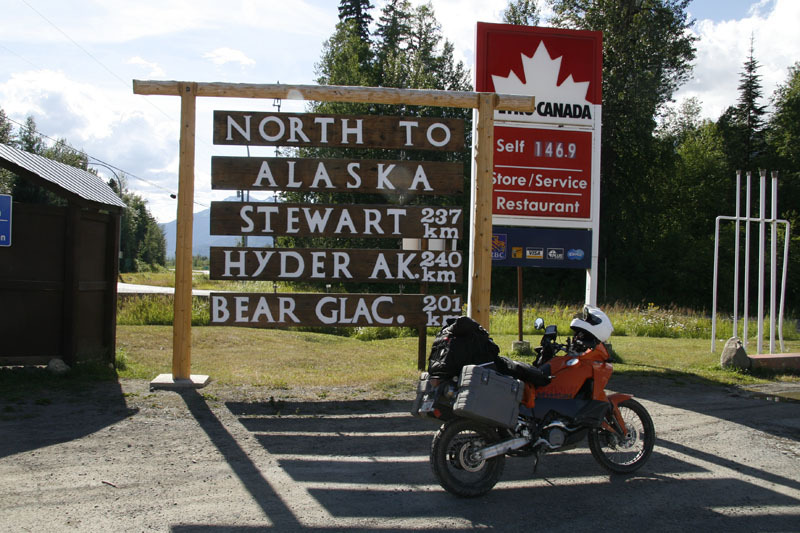 Originally the title was tied to riding Northern British Columbia, but now the Yukon is within striking distance. So why stop? Riding solo would be one reason. 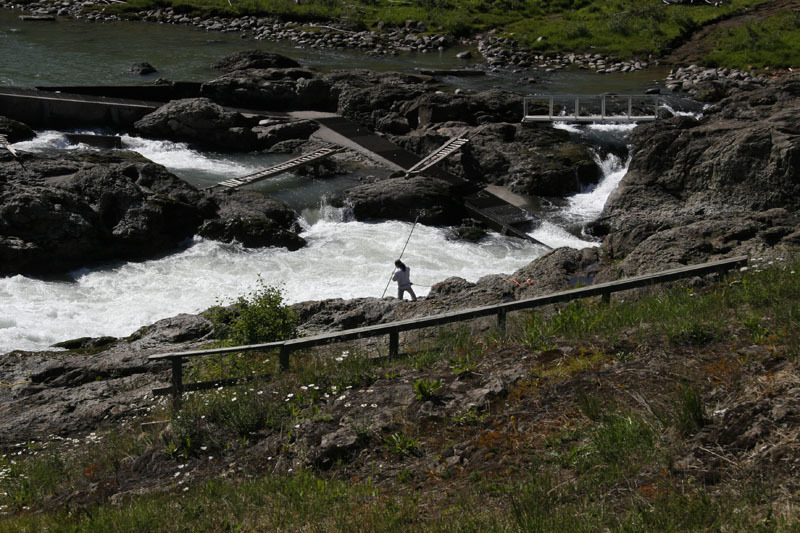 Earlier about 20km north-west of Decker Lake I detoured from Highway 16 in an attempt find an off road route partway to Smithers. With the GPS pointing me down roads disused and overgrown with brush and then through flowered meadows. I was with the program, following the mauve line charted through obviously outdated map data. This is Adventure, you can pick the daisies out of the drive-train later. The “road” is regained as a four-by-four track rutting though a marshy crossing. Minor stuff really. 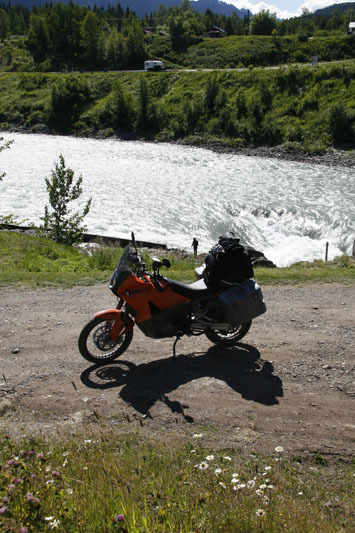 The 990 Adventure’s cardinal rule seems to be more throttle. The ruts grab the front end, the rear slides out in the slick of the mud, claxons sound in my mind. There’s no time for cursing. A bad bike lets you get away with nothing. A good bike encourages you to do the right thing. I’ll assume the KTM 990 Adventure is a good bike. Some combination of the following happened in a nonce; a foot goes out, ease the throttle, loosen the grip, bit more throttle again, up on the pegs. Through some moto-engineering alchemy the Adventure, overloaded and over-weighted, stays upright in a series of actions that remain unsorted even in recollection. Dry ground, a fast-beating heart, and a lot panting remain. The GPS points me across another meadow to a road that owns only virtual existence in software and history. I try an alternate route, the Garmin recalculating, a path that eventually spills me out onto a logging road that feels like a freeway by comparison. Boiling around a corner, I’m confronted with off-road’s final insult, a locked gate and a no trespassing sign. There’s nothing left to do, but backtrack. Through the second crossing of the slippery muck I slow to a crawl and feet down churn my way through. My confidence is shaken. My mind filled with worries over riding alone. What if I dump the bike? What if I break it or myself? What if I break down? It’s easy to “what if” the adventure right out of yourself. What if I push on? That leads to other questions. How far will I go? What will I see? What will I learn? Sixty-kilometers after Kismet I’m unprepared, vulnerable and alone, yet I’m still feeling the push to ride on. The 990 Adventure has been rock solid for the past 3500km of on and off road. Why should I doubt it? Another thought occurs. Nothing to the North will be more challenging than today’s off road and non-road excursion, so what do I have to fear? Nothing. Shakespeare’s Hamlet had it right. 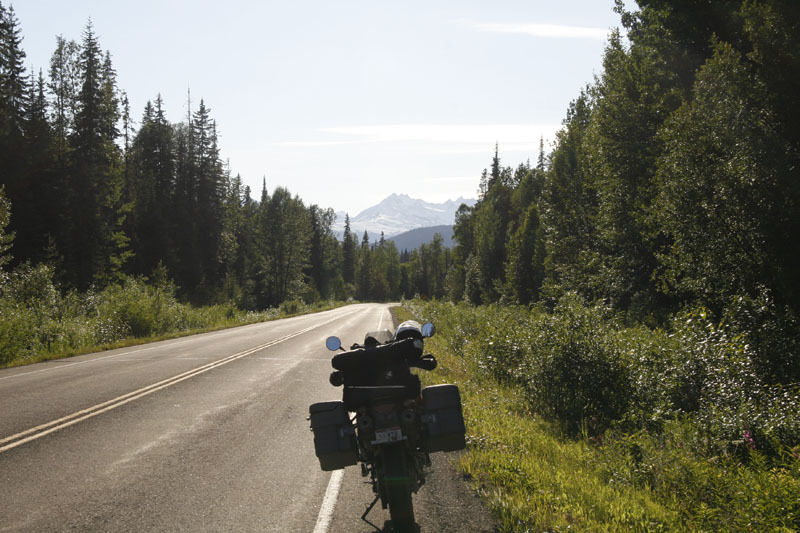 Streams of motorcyclists, a mix of cruisers and adventure bikes, are oncoming southwards. All it takes is one dust covered Harley with Yukon plates to put this in context. The KTM rails along the sweeping curves of the 37, a highway and destination rolled into one. We’re charging onwards towards the land of the midnight sun. The road bracketed by the Skeena and Coast mountain ranges and wrapped in overgrowth as if nature were reclaiming it offers beauty well beyond the twists and turns. There’s something for the soul here. I arrive late into the Meziadin Lake campground and begin to set up camp. I’m put to shame by a group of cyclists who’s tents seem to transform instantly. My Canadian Tire version is an exercise knock-off imperfection as it lists badly and threatens to topple on the wind. After the first half-hour of cursing and a relocation to a campsite with better wind protection I have named my tent; H.O.T. – Hell’s Own Tent.